In 1964 George Mason College moved to its permanent location in Fairfax from the former elementary school in Bailey's Crossroads. Freshmen who arrived at Mason in 1964, a year characterized by Director Robert H. Reid as an “heroic” period for the college in his annual report that year, would be part of Mason’s first graduating class as a four-year school. Conceived in 1965 and approved by the state legislature in 1966, George Mason’s new degree-granting program would graduate its first class in June of 1968. What was the last year of college life at George Mason College like for these young men and women who comprised the graduating class? There were no dorms - Mason would not have on-campus housing until 1977. George Mason’s three intercollegiate athletic teams (baseball, basketball, and rugby) were nicknamed the “Marauders” at the time. In 1968 there were three Greek organizations: fraternities Tau Kappa Epsilon and Delta Tau Sigma, and sorority Lambda Tau Omega. Mason Day 1968 boasted a dunk tank, the “Spring Car Bash,” a Miss GMC contest, and the infamous, and very muddy, tug of war. The Pep Club hosted a luau, which featured grass skirts and a barbecue. One of the graduating class's very own was elected Student Government president. The spring dance was titled “The Ides of March gone Psychedelic.” Of course, the intense discussion over the Vietnam War and student/faculty protest dominated the pages of the school newspaper, The Gunston Ledger. A regulation passed on to George Mason College from the University at Charlottesville governing campus protest generated much controversy, and there was much debate over revisions to the George Mason College Constitution. Preparation for the Commencement started in February of 1968. The Commencement Committee was comprised of students and faculty members. Dr. B. Prince Woodard, Chairman of the State Council for Higher Education, was asked to speak at the ceremony. The Ledger estimated that as many as eighty seniors would be part of the commencement in an article that month, and candidates were told that they were required to submit a five-dollar diploma fee to the Bursar’s Office in order to graduate. Of course, the 1968 Commencement would experience small amount of protest. Two outspoken Mason faculty members, Dr. James M. Shea of Philosophy and Larry Leftoff of ­­­­­­the Mathematics Department­­ wished to make a statement by not wearing caps and robes during the ceremony. They bought their intentions to the attention of the Commencement Ceremony Marshal in advance. He suggested that they then simply not march in the procession, a request to which they complied. Professors Shea and Leftoff later suggested in a September 20, 1968 letter to the editor of the Ledger, that George Mason College should abandon the tradition of wearing caps and gowns at graduation, starting its own new tradition. They proposed that instead of spending money collected from the students for caps and gowns, they use it for “more humanely productive projects” instead. 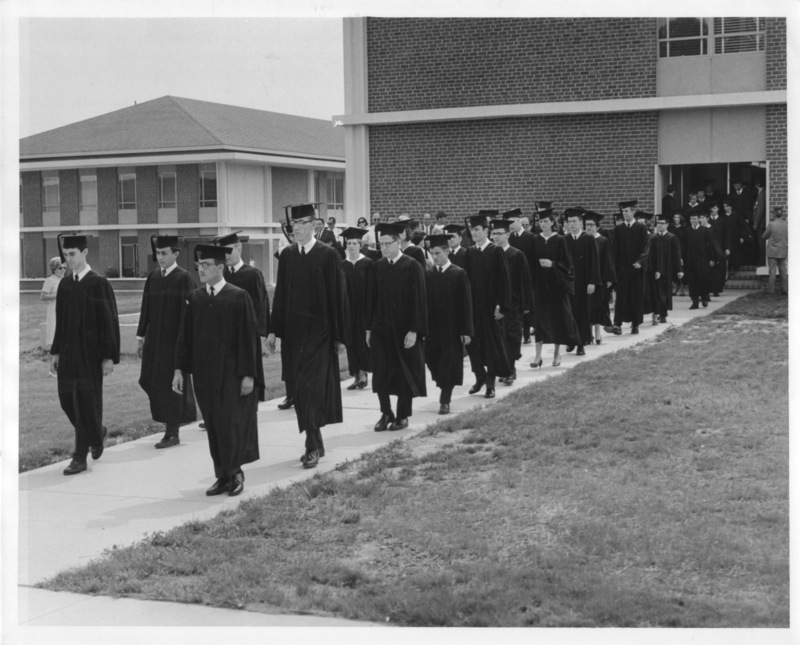 Commencement took place on June 9, 1968 in the newly-constructed Lecture Hall, Auditorium I. It was held indoors because the weather forecast called for rain. Start time was 3:15. According to the account in an annotated program belonging to the Assistant Marshall, the proceedings went as follows. The first guests arrived and were seated at 2:25. The graduating class robed in the East Building before the ceremony and entered the auditorium to “Pomp and Circumstance” played by the Fairfax High School Band shortly before 3:30. A moment of silence was observed for Robert F. Kennedy, who was assassinated three days earlier. The Reverend Kenneth C. Holmstrup gave the Invocation. Chancellor Thompson introduced the Platform Party and Dean Krug made some brief remarks. Dr. Woodard gave a 22-minute address entitled “Expectations”, in which he told the graduates that Mason would grow so fast that they would “need a map just to get around campus” at their ten-year reunion. The address was followed by conferral. The conferring of degrees for the fifty-two graduates took about eight minutes, and the ceremony was over at 4:22. Five of the graduates were recognized for Distinction, while four others earned High Distinction honors. After the ceremony was finished the graduates stepped outside for a photograph. The entire graduating class was photographed against the west side of the Lecture Hall, just outside the doors. By 4:30 all guests had gone, and it had begun to rain.